On December 5 will be held the second event of the advertising project “Advertising Civilization” in Kharkiv. The event will be the next step towards a big goal – to raise the level of the marketing and advertising in the regions, stated the press release of the marketing agency «Defense», the organizer of the project. In Kharkiv will arrive representatives of the advertising industry from advertising, creative and digital agencies Grape Ukraine, Prodigi, Milk Branding, Agama Communications and representatives of Privatbank. “We invite speakers who have vast experience in the Ukrainian and foreign markets. They are the unique archive of information and they are ready to share it. This time regional specialists will have opportunity to learn more about the bold punk marketing, effective dialogue with the brand in social media and packaging design,” shared the organizer Yana Chumak. The encourager of the second event of the Advertising civilization became the “father” of advertising – David Ogilvy. This time the speakers and guests will be carried to the era of the industry origin – the 1950s, the United States. Then the men in suits with perfect haircuts and expensive cigars laid the foundations for the future advertising world. “The best-known creative director of the last century not only created a promotional product but also wanted to teach the world. A lot of people have read his books but few of them follow his advices. Advertising and Marketing “in Kharkiv” fail to meet the requirements of David Ogilvy. If only he came in our city he would bear into tears from advertising on local TV, billboards on the streets, posters in the metro and commercials on the radio,” said the project coordinator Katherine Gusachenko. This event is for practitioners – marketers, advertisers, PR-specialists, business owners and students. 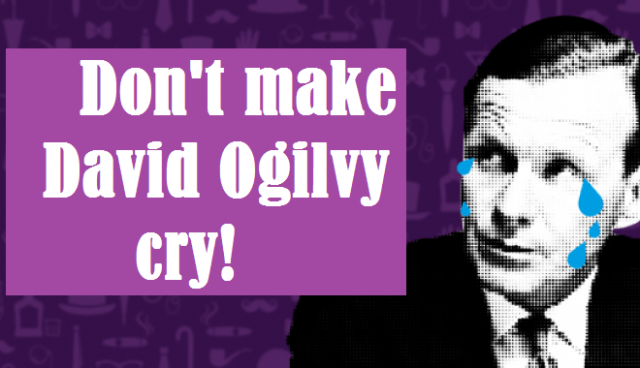 For those who every day has to say to himself/herself: “Don’t make David Ogilvy cry!” For those who every day has to learn and create high-quality promotional product.